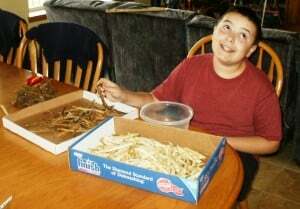 The boys and I continue working on cleaning up the garden and prepping food for winter storage. One of my recent additions to the mix is shell beans, which have to be one of the easiest storage crops available. Simply let the beans mature and dry on the vine, gather the dried pods, shell and store in an airtight container in a cool, dry location. That's it. Even little boys can do it. 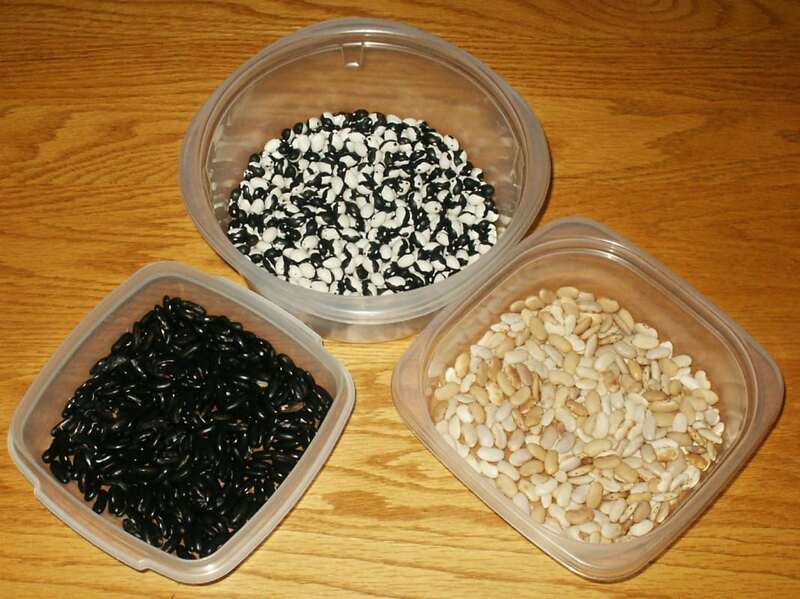 You can use the same method to save beans for seed. Beans tend to be self-fertile, which means they don't easily cross breed. This means you can grow more than one variety in your garden and still keep the seed pure, as long as they are separated from each other. I try to separate mine by at least six feet and put heavily flowering plants (like borage) between varieties so the bees are even less likely to spread pollen between bean varieties. This year I grew Tiger Eye, Calypso, Emerite and Purple Podded Pole beans. Tiger Eyes are great for baked beans. They have a velvety, almost buttery texture. The Calypso beans (shown at the top of the post) were given to me by a friend of the family and this is the first year I have enough to eat, so I will have to try them in a couple of different recipes. The boys call them “cow beans” because of their bright black and white pattern. The Emerite and Purple Podded pole beans are eaten as snap beans. I save seed from each of them to replant each year. In our area I have found that my varieties need a full season to mature, so I set aside a number of plants (for instance, one end of a double row) that I mark and do not harvest from during the season which are grown solely for seed propagation. Emerite is a very productive green podded pole bean. Its seeds are black. Purple Podded Pole Beans are exactly that, but they turn green when cooked. Their seeds are tan. Here's a line up of the pantry stash before this years' harvest. From left to right: Tiger Eye, Scarlet Beauty Elite, Red and White, Polish (these were brought over from Poland by the seed saver friend's grandmother), Applebee and Pink Kidney. I wish my camera could do them justice. They come is such a vibrant array of colors, with the shine and feel of polished glass. The boys and I enjoy simply running our fingers through them. The Tiger Eye beans were purchased from Fedco Seeds, all the others were shared with me. The acid medium (vinegar,whey) helps to neutralize the enzyme inhibitors (phytates), making beans and grains more digestible and nutrient-dense. WonderfulIngredients also provides a soaking chart at the above URL for various types of beans and grains. My measurements tend to be a little more informal – eye it up and pour, let it soak overnight. Soaking also reduces cooking time and may reduce flatulence. What are phytates and why should I care what they are or want to remove them? Phytates are the salts of phytic acid. More correctly named inositol hexakisphosphate, the acid (or salt) is a phosphorus based compound found in the many plants. Specifically those high in fiber, with concentrations generally being highest in foods containing large amounts of insoluble fiber. Occurring most frequently in nuts, seeds, legumes, and whole grains, phytates serve as the primary mechanism by which plants store phosphorus. Like so many other things in life, there is some debate about the health effects of phytates. Detractors claim they exhibit an anti-nutrient effect, while promoters tout their potential for reducing a variety of ills. For quite some time, phytates have been viewed as “anti-nutrients.” Since non-ruminant animals (i.e. humans) lack the proper enzymes to digest phytates, the phosphorus in these molecules is generally not available (for nutritional purposes) to humans. This means that consuming foods high in phytates will not serve to meet daily requirements for phosphorus. From a nutritional perspective, phytic acid is known to strongly complex many cations, and when in the presence of these nutrients, the acid reacts to form a salt, known as a phytate. 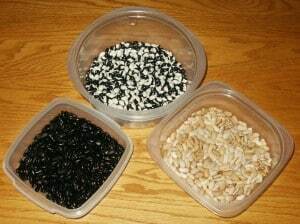 Included in that list are minerals that will complex with phytic acid are: calcium, magnesium, zinc, and iron. This means that phytic acid will scavenge these minerals, reducing their availability to serve nutritional needs, which concerns some nutritional experts, as it presents the potential for nutritional deficiencies. From a practical perspective, this has the greatest potential to impact vegetarians, pregnant women, and the extremely malnourished, due their generally low mineral consumption. On the flip side of this argument, since phytates are found in high fiber foods, it is thought that they may possess strong cancer suppressing activity as well. High fiber foods have shown protective benefits against a wide variety of cancers. In addition, phytates have shown some ability to suppress free radicals in the body. Some experts have suggested that the ability to complex iron may be the root of their function in this capacity. I think I'd just as soon get those extra minerals out of what I'm eating, so I soak. As another interesting aside, if you visit Rebuild from Depression, the author is very much in favor of reducing phytate consumption to assist with recovery from depression. On her website she gives a pretty exhaustive breakdown of various methods of reducing phytates and their effectiveness. Her conclusion is a long soak in hot water because she prefers the flavor. With what I've been cooking, I really don't notice a difference. 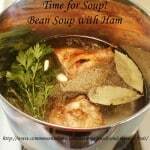 Here is one of my favorite bean recipes. Soak beans overnight in warm water or water and vinegar. Put bones and other ingredients except carrots in pot and simmer on low for at least four hours. I prefer all day (my goal here is to get get as much calcium, gelatin and other nutrients out of the bones as possible). Add additional water as needed. About an hour before serving, remove bones and pick off meat, return meat to pot. Remove parsley stems. 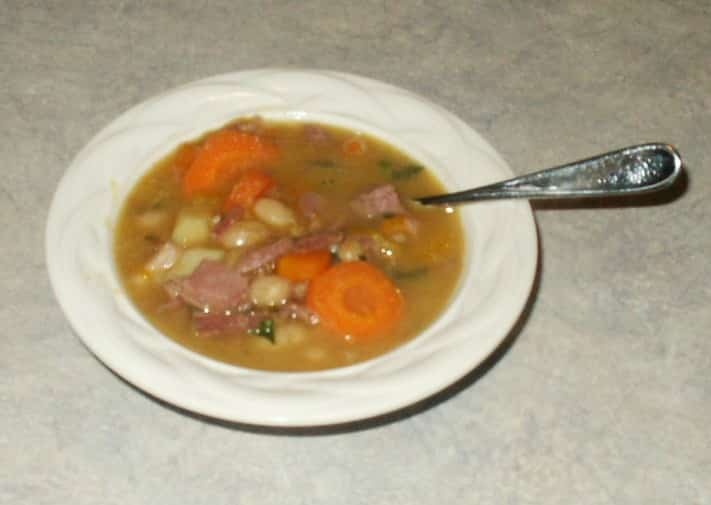 If you want a meatier soup, you can add a little extra ham at this point. Add carrots and potatoes and cook soup until tender. Remove bay leaf before serving. facinating info on phytates, thank you! 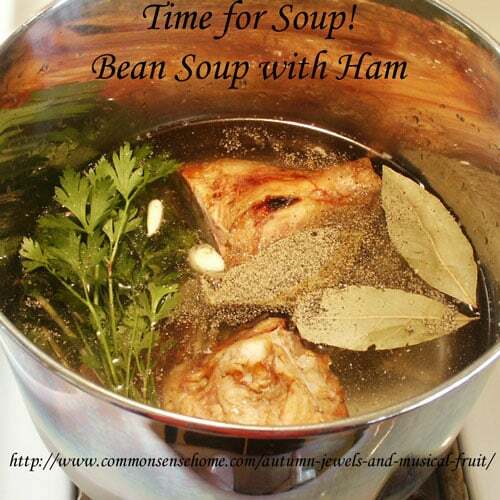 OK, now my brain is smelling bean and ham soup cooking, and it's making me HUNGRY!! We grew up on lots of beans, such good food, feast or famine. Your're right, beans are easy to grow, harvest, dry, and EAT!! Great post to build upon Amanda's Rebuild with Phytates. I have so much to blog about but out of the loop for a while, till I get my hubby's health healed up. Here's a much easier way to shell those beans. Put them in a feed sack sort of bag and stomp on it!!! Keep stomping!!! Then if you want to be very creative pour it out in front of a fan. The pods and dust will blow away and the beans will fall! Or if you want to play it safely then you can pick the beans out of the bag!!! Makes a hard job fun. I'm betting your boys will like the bean stomp! Diane – anything that involves beating on something and my youngest would be all over it. How do you get all the grit out of the beans after the smashing? One of things I like best about doing it this way is that the beans come out very clean. I love the article, and tried to go to Rebuild from Depression. The link goes to http://www.phyticacid.org and requires a password. Is this the same site? Hmmm… it’s been a while since I updated this post, and it appears that it’s likely the same site, but the password protection is something new. Not sure what’s going on, but I’ll likely remove that from the post unless I find a way to easily access the information. Thanks for letting me know about the issue.